at the corner of 4th & New York - 129 W. 4th St.
Monday- Friday: 8:00 a.m. to 4:30 p.m.
785-364-9625 and ask for the Home Health and Hospice on call nurse. Holton Community Hospital Home Health offers skilled nursing care, physical, occupational, and speech therapy services if you are unable to leave home for care. Our dedicated staff with over 75 years experience can help with wound care, medication management, diabetic education, rehabilitation needs, as well as needs arising from worsening chronic illnesses. We believe that home is often the best place to be, even during illness. We are proud to continue to serve our Jackson County Community and surrounding area. Holton Community Hospital Hospice offers end-of-life care to you or a loved one and family. 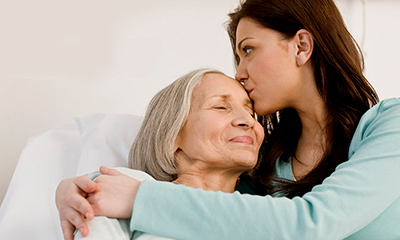 Hospice is widely recognized as the best kind of care when a person's illness cannot be cured or aggressively treated. Our hospice team cares for patients living at home and in local nursing homes. Let our expert team of Physicians, Registered Nurses, Social Workers, Chaplains, and Volunteers assist you with your needs. We are proud to be partnered with Jackson County Friends of Hospice. We are honored to continue to serve our Jackson County Community and surrounding areas.